This book is about an expedition to Alaska in 1885. It’s loosely based on a real-life expedition taken by Lt. Henry J. Allen but I’m sure the real adventurers didn’t encounter what those in this book did. For those of you who have read this author’s “The Snow Child”, (finalist for the Pulitzer Prize) you’ll know that folklore and mythology play a huge role in her work. While the book feels like a true story since it includes photos, newspaper clippings, drawings, artifacts, diary entries and official documents, the events in this story will fill your mind with wonder as it sends chills down your spine. Lt. Col. Allen Forrester takes off for Alaska and the Wolverine River with a small team of men to explore the territory. None of the other teams sent out have made it back alive so this is a very dangerous task they’ve taken on. Cannibalism is rumored among the Indian tribes. Food will be scarce and the weather is brutal. As hard as the journey is anticipated to be, none of them can imagine what is actually ahead for them. Forrester has left behind his wife, Sophie, who is an adventurous soul herself and longs to travel to Alaska beside him. But an unexpected event stops her from going and she must content herself at home. The love letters sent between Allen and Sophie are lovely and the author has done an excellent job of fleshing out these two characters and their love for each other. I especially enjoyed reading about Sophie’s love of birds and her beginnings as a photographer. There are parts that are a bit slow moving and probably could have been deleted without much of a loss but most of the book flows along quite well and keeps your interest. This is a beautifully written book. 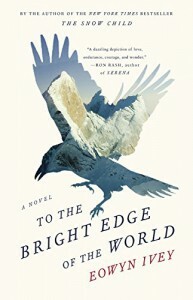 The descriptions of Alaska are breathtaking, the adventures are suspenseful and the witch doctor is nightmare inducing. Magical and recommended.